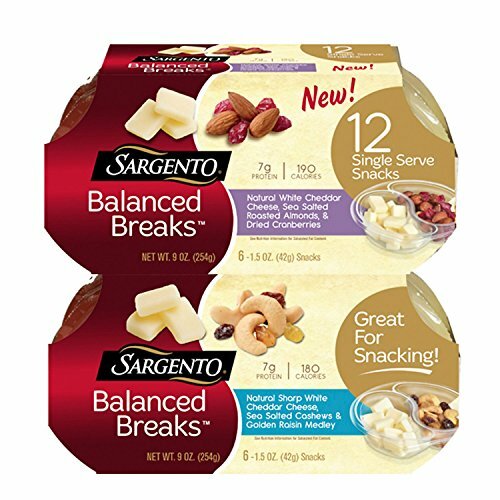 Sargento® Balanced Breaks® are the perfect combination of creamy cheese, crunchy nuts and sweet dried fruits for a delicious, all-in-one snack. You get two flavors: one with creamy, tangy sharp white cheddar cheese, buttery, sea-salted cashews and a medley of golden raisins; the other has natural white cheddar with sea salted, roasted almonds and tart, dried cranberries. With these, you'll find the perfect balance of taste and nutrition. If you have any questions about this product by Sargento, contact us by completing and submitting the form below. If you are looking for a specif part number, please include it with your message.